Today was another fantastic class, one that will totally change the way I’ve been painting. 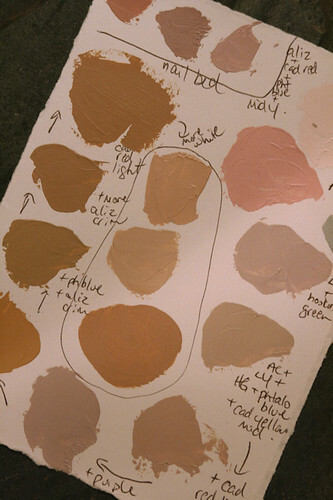 We focused solely on skin tones today, starting off by trying to create a color palette of all the colors that are in our own hands. Just looking at the back of my hand, really studying it, I realized how silly it is to try to paint people by coloring in their skin with just one shade. Try looking at your hand and squinting to get the overall color. Does it look ANYTHING like that “flesh” color crayon that came in our Crayola boxes? The translucency of skin means we pick up the blues from our veins, the bright reds around our knuckles, yellows, oranges, pinks…so many colors! Then look at your nail bed. More! No wonder so many artists stick their subjects’ hands in pockets. 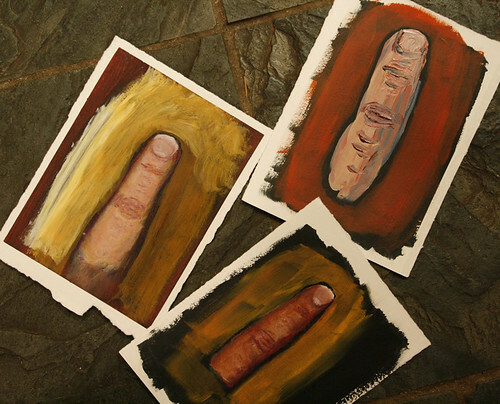 The rest of the class and our homework was to draw our finger in 3 different styles – one dry brushed (very blendy), one with repetitive brush strokes and one with big bold scooping up the paint strokes. It really surprised me how long it took to mix the paint to get just the right colors. And even once you had them, the paintings still looked flat and lifeless until I added some really bold pops of color. That’s the thing I’m learning in this class more than anything else – exaggerate! Go bold. It works! Great work on the skin tones! That is the reason I don’t paint faces. I can’t get the tones down! The very bottom one is my favorite.